As a valuable asset to any property, residential or commercial, wooden floors demand thorough maintenance as a common victim of heavy traffic. Your floors’ finish may protect the wood from the larger brunt of traffic and spills, but eventually, the scratches, scuff marks and overall wear and tear land and take away from your charm. The fastest way to turn back time on your floors is through our skilled wooden floor repair which works towards eliminating all damage and imperfections from your floors. Years in the business have given us a greater understanding of wooden floors. We seek to provide the best possible service that brings you maximum satisfaction and also preserve the environment. Therefore, all oils, wax, and finishes used to coat your floors at the final stages of repair are made from all natural materials. This keeps your home and business free from any gradual chemical emissions. Your floorboard repair service takes place with limited disturbance to your routine and includes thorough an examination before any work takes place. 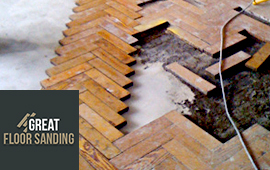 Whether your floors are hardwood, softwood or parquet, we can restore them to their former glory! For wood floorings beyond repair, the experienced floor fitters in London can help you choose the best flooring type for your property. 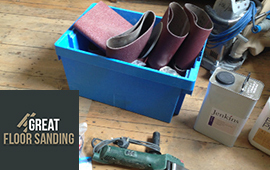 Sanding: Sanding is the most popular and basic repair technique available. The experts strip your floor from its varnish to level all uneven places, remove splinters and jutting nails. Gap filling: Sometimes wood moves, contorts and cracks. Once sanding is fully complete, we fill the gaps and cracks to create a safe, sturdy surface that can be coated with a strong finish and ensure its longevity. Floorboard Removal: In case the damage is too substantial to be tackled with care, what we can do is have the board removed and then find a suitable substitute that matches your floor’s material and patterns. We can even help you bring the classy look of the staircases in your home. Book Your Repair Service Today! The easiest way to secure a team to come to your home or place of business is to give us a call at 020 3404 9697. You can be sure that there is always someone waiting on the other end of the line whether it’s a weekday or the weekend and holidays. We understand accidents can happen at all times and a swift reaction is needed. That’s why all our lines remain operational from Monday to Sunday – no exceptions! Ask further questions about the service, schedule an on-site quotation or inquire about pricing. We’re here to help you!